Bronwyn hits the highly mannered world of Edith Wharton era Manhattan like a bomb. A series of suitors, both young and old, find her irresistible, but the willful girl’s illicit lovers begin to turn up murdered. I have very few complaints regarding the quality of the writing. Zimmerman has done an excellent job researching her subject and capturing the era and setting, from the western mining towns to the upscale parlors of New York. She also does a great job of capturing a consistent voice in her narrator. The plot is certainly original, and I truly appreciated the author's use of her research throughout the story. My main concern regarding the quality of writing is in the pacing of the novel. There were moments where the story became so slow and so bogged down in detail that the flow of the plot really suffered. For the first three quarters of the novel, we are getting the narrator's story as he is relating it to his lawyers. It's told in past tense, but this is occasionally interrupted by his lawyers, which managed to throw me off quite a few times, as there's no real demarcation, other than the switch into present tense. The final quarter of the book is also told in present tense, and moves at a much quicker pace than the rest of the novel. It felt a bit disjointed and disorienting. I really wanted to love this book. I have this fascination with the idea of feral children and was quick to add this to my TBR list when I read about it in School Library Journal. Unfortunately, the book just fell flat for me. A huge problem was that I just couldn't bear the narrator. I'm normally fine with unlikable and unreliable narrators, but this character's voice just grated on my ever nerve. He's whiny, spoiled, and self-indulgent. While this isn't a fault with the novel (the author intended for the narrator to sound that way and she does a great job at maintaining consistency), my dislike for him really hampered my personal enjoyment of the book. 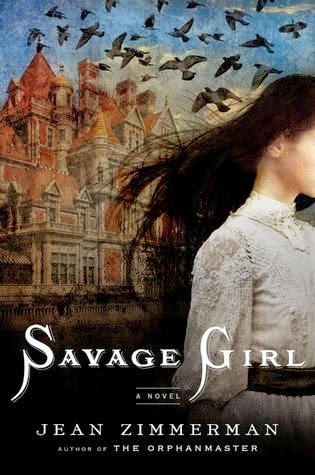 There's also the whole issue of the Savage Girl and why our narrator falls in love with her. While my dislike of the narrator was an issue of personal preference, I feel something was missing from the novel in terms of explaining why she is so wonderful and so beguiling. Why do people just keep falling in love with her for no reason? Did I miss something? I would have liked to get to know more about her, I think, and less about our narrator. I think this book definitely has an audience, particularly among those who love historical fiction, but there were aspects that made it really difficult for me to get behind. While the narrator was well-developed (if incredibly irritating), most of the other characters were flat and unbelievable. And the pacing and flow left a lot to be desired in terms of how engrossed I became (or did not become) in the book itself. I love the subject and I greatly appreciate how well researched the book is, and I might try the author again in the future, but this one didn't blow me away. Thank you to Penguin for providing a copy for me to review!